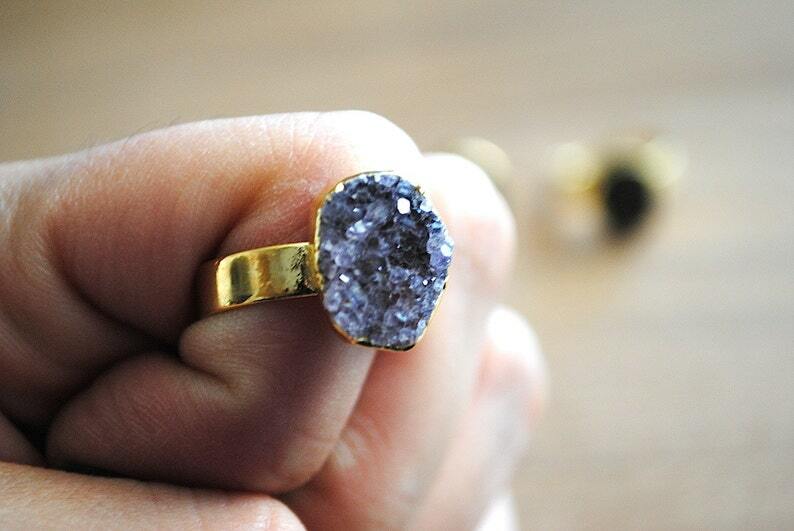 ⊿⊿ These adjustable gold plated rings feature natural free form agate druzy edged in gold plating. Druzy or druse refers to the coating of fine crystals on the surface of the agate. They measure approximately 1/2" to 3/4" in length and about 1/2" in width. ⊿⊿ The colors range from a darker grey to a lighter grey to a deeper matte green (actual color will vary from the colors on your screen). ⊿⊿ The ring base is a brass band plated in gold. This ring base is pliable enough to adjust to most sizes (sizes 5.5 to about 10 on average). ⊿⊿ Agate is known for many metaphysical properties, such as preventing insomnia, attracting good fortune, enhancing creativity, promoting pleasant dreams and calming stress. ⊿⊿ Please note that although your ring is securely fastened, you should take care when wearing it and not submerge it in water or wear it during strenuous activities. When you make adjustments to the fit, please do so carefully. ⊿⊿ This is a one of a kind ring - you will get the ring shown in the photographs. Make your selection at check out.